Bottega Veneta will launch the Parco Palladiano collection in May. The six luxury unisex fragrances are designed to trace a walk in the gardens of the Villa Capra La Rotonda (designed by Andrea Palladio), near Vicenza. The fragrances were developed by perfumers Michel Almairac, Daniela Andrier and Alexis Dadier. Update ~ The US price will be $295. Additional information above in brackets via Vogue. Oooooooh, these sound (and look) interesting! Could be — we’ll see if they are worth the price! I could easily pop over to Bottega to give these a whiff, but like you Robin, not worth going out of my way for the same old fare just marked up 60%. I find the BV brand very appealing – slightly quirky high quality Italian style. But I’m not going to seek these out. If they made a discovery set, like Hermes where you pick 4 x 15ml, I would be much more tempted. I know Robin – preaching to the choir. I agree about the discovery set, plus why so many perfumes? 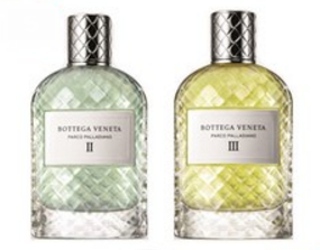 Bottega Veneta used to only put out flankers to the original. So many perfumes are out there these days. Years ago, we were lucky to get one new fragrance from a House once every year or two. Now each line has bottles and bottles and it doesn’t seem as exciting or special now. That’s what I like about Aedes de Venustas…one a year. I agree! It would be so nice if some of these companies would slow down and put out something unique or just really well done. Maybe some of the non-perfumista general public is not as discerning nowadays as they were years ago? The younger generation didn’t grow up with beautiful chypres and orientals so they don’t have a point of reference to compare the scents being churned out now. My guess is that they put out several frags at one time for financial reasons in an attempt to equalize their losses if some flop. Between these bottles, the Lalique, and the Aroma M Geisha Vanilla Hinoki, there has been some serious bottle pr0n on NST this week. Good stuff!